A coalition of education advocates and business leaders on Thursday called on Gov. Doug Ducey and the Arizona Legislature to make “sustainable, permanent” investments in the state’s public schools during the legislative session that starts Jan. 8. But the bigger news may be what they didn’t say: Advocates hinted that they would take the issue to the ballot box in November if leaders don’t heed their demands. The coalition, AZ Schools Now, presented what it called a “menu” of options it said the Legislature could choose from this year to infuse hundreds of millions of new dollars into Arizona schools without the approval of voters or by raising sales taxes. The options involve eliminating school tax credits, freezing pending corporate income-tax cuts and raising income-tax rates on wealthy households — options unlikely to gain traction in the Republican-controlled Legislature, particularly in an election year. Advocates who spoke outside the Arizona Capitol on Thursday said their suggestions were realistic efforts that state lawmakers could pursue to help address schools’ years-long funding crisis. “This coalition has offered numerous, realistic long-term solutions that can work to bridge the $1 billion gap and dig us out of 51st place nationally,” said Alexis Aguirre, a second-grade teacher in the Osborn School District. The group, along with several other education and advocacy groups, will take their message to the public Saturday. 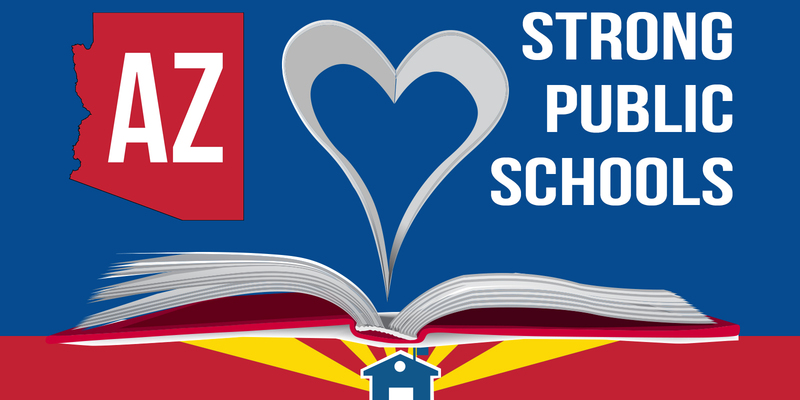 A March to Save Our Schools is scheduled from 9 a.m. to noon at the Arizona Capitol. It will include food trucks, bounce houses for the children and live music. This legislative session will start with the 2018 election looming. Some education leaders and advocates have described the election as the ideal time for renewing and potentially expanding Proposition 301. Prop. 301, a 0.6 cent education sales tax that pumps $600 million into Arizona schools, is set to expire in mid-2021. A group of business leaders announced a plan in December to put a 1.5 cent sales tax on the 2020 ballot, but advocates said Thursday that schools could not afford to wait until then to decide on the funding mechanism. “Legislative session comes first and we’re putting out this call for legislators to do their job this session,” said Dana Wolfe Naimark, president and CEO of the Children’s Action Alliance. A recent poll commissioned by the Expect More Arizona non-profit showed that education — primarily, teacher pay — remains a priority for a majority of Arizona voters. While optimistic about voters’ sentiment on funding public education, Wolfe Naimark also acknowledged challenges with the coalition’s suggestions. Ducey won office in 2014 on a pledge to not raise taxes. One of the advocates’ suggestions — redirecting “results-based” funding that is going to high-achieving schools — would affect a new performance program championed by the governor. Daniel Scarpinato, spokesman for Ducey, has said that improving schools’ funding and boosting teachers’ pay remains one of the governor’s top priorities. Ducey will announce his legislative agenda at Monday’s State of the State address. – Originally posted by azcentral.com on 01/05/2018, written by Ricardo Cano.